HERTALAN® products have been awarded The DUBOkeur® accreditation. The DUBOkeur® certificate proves that a product, material or property is an environmentally friendly choice. This is demonstrated by means of an environmental life cycle assessment made by the Dutch Institute for Building Biology and Ecology (NIBE), the research institute for environmental building materials. DUBOkeur® is an Environmental Product Declaration. With DUBOkeur® certification, products, raw materials and housing have independent and scientific proof to demonstrate that they are a sustainable choice. The purpose of the DUBOkeur® label is solely for the top end of the market in the field of sustainability. This award is a very important recognition of the sustainable features of Hertalan EPDM membrane and shows that Hertalan EPDM rubber liners are one of the most environmentally friendly products in the flat roof sector. The NIBE as an independent research institute assesses the environmental impact of a construction product throughout its life-cycle, based upon 17 (environmental) issues ranging from global warming to recycling or treatment of waste. Only the construction products score environmentally best qualify for DUBOkeur ®. "In a time where distinguished sustainability is becoming increasingly important, the DUBOkeur ® forms a clear and scientific basis for putting an environmentally friendly product on the market. A product is only eligible for DUBOkeur ® if it falls in the environmental category 1 or 2. The DUBOkeur ® certificate is exclusively for real sustainable products". HERTALAN® EPDM sheets have an Classification 1A, this is the highest achievable ranking. 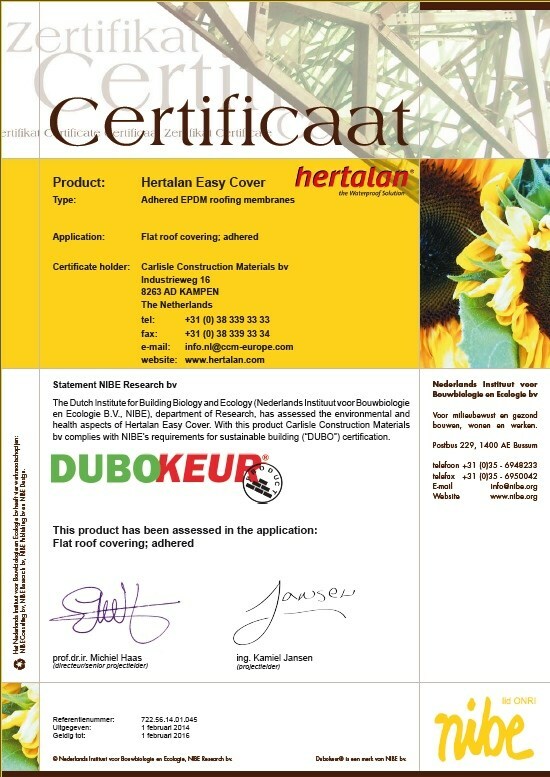 For HERTALAN® the DUBOkeur® certificate is an important recognition of the sustainable features of Hertalan EPDM rubber. The properties of our product make sure that the material is acknowledged as an environmentally friendly product. Hertalan EPDM is ecologically friendly, does not leach out, is a relatively thin and has a significant lifespan. These aspects contribute to it that we are proud of the products we daily produce in our factory.